The AnimeJapan stage event announced a TV anime adaptation of comedy manga Africa no Salaryman. 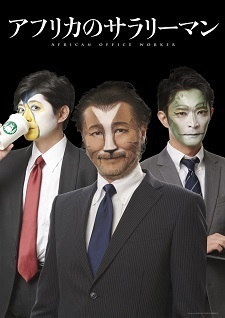 The project was initially announced early March, displaying a key visual of voice actors Akio Ootsuka (Black Jack), Kenjirou Tsuda (ACCA: 13-ku Kansatsu-ka), and Hiro Shimono (Berserk) with makeup of their representing animals. Tetsuya Tatamitani (Love In Ruins) will direct the anime adaptation. More projects will come later. The manga is currently serializing via Gene pixiv by Gum, and three physical volumes have been released as of last January. The manga previously received an adaptation by Tate Anime in June 2017 for a total of ten episodes. After so much junk news, this one does seem interesting. Ok, this looks weird to say the least. Toucans live in America, not Africa. As a Brazilian I should know. Kenjirou Tsuda is one of the characters so i might give this a try. The show it titled after the main character Lion. His the Africa no Salaryman (African Office Worker). The show itself features many animals from all over the world such as the South American toucan, the North American horned lizard, the Australian dingo, European Welsh mountain sheep, etc. Anyway, from the main cast this seems interesting. The PV features live action but its an anime? The PV is for the whole project which was unknown, just the key visual which shows seiyuu. The seiyuus didn't know it would get TV anime (as first project), either until seeing that end note at the PV during the event.